SALT LAKE CITY, Utah, March 5, 2018 (Gephardt Daily) — Can being weird be a good thing? In the case of Plan-B’s “The Weird Play,” a co-production with Sackerson, playing in the Studio Theatre at the Rose Wagner Performing Arts Center downtown through March 11, the answer is unequivocally, yes. The purpose of this sort of theatre is that if the audience is not bound by watching a realistic story, it frees up our brains to feel possibly larger, more visceral emotions, relating to deep inward feelings rather than to intellect. In this case, the play is a meditation on love. The show is based around a character called One, played by Susanna Florence, and another called Two, played by Dee-Dee Darby-Duffin. They inhabit a large, white room, that we learn has a lot of steps leading up to it and is high above a city. It might be heaven, it might be purgatory. I suppose it could even be some kind of inverted hell. The character of Two could be a God of some sort, could be the personification of love; all shades of love, which also incorporates abusive and destructive love. April Fossen plays Three, a character that appears in the room mid-way through the play, then exits again, then reappears when One decides to leave the room and venture down to the city below. Experimental plays at their worst (and as an offshoot the actors and the directors who assemble them) leave us with simply a confusing void, as we are shown chaos that simply makes us feel unsettled and scrambled. But at their best, as in this case, plays like this crack our hearts wide open and ruffle up the emotions we try to keep locked down on a daily basis. Because of Nii’s writing, as well as the direction by Alex Ungerman and the performances of Darby-Duffin, Florence and Fossen, the evening is esoteric to be sure, but it also led me to ponder fundamental questions about the forms love and devotion can take, how love can transmogrify into boredom, even abuse; and also why love might end. Also, it reminds us to try to really see the people that are the closest to us. So even though the content is magically slippery, the actor’s performances are completely relatable, and I had no trouble following their trajectories. The production elements are also utterly stunning. Sound design is by Cheryl Cluff, with lighting by Jaron Hermansen, costumes by Phil Lowe, set by Halee Rasmussen, and props by Arika Schockmel. There’s a sequence where One begins to pull white books from the bookshelves around the room, and as she removes each one, colored light shines from behind the bookshelves, which then pulses into different colors. It’s sequences like this that make “The Weird Play” the most visually arresting show I’ve seen in a long while, and in all, an evening that I would wholeheartedly recommend you do not miss. “The Weird Play” runs through March 11 at the Rose Wagner, 138 W. Broadway (300 South). The show plays Thursday, Friday and Saturday at 8 p.m., with additional performances Saturday at 4 p.m. and Sunday at 2 p.m. Tickets are $20; the run is sold out, but a pre-paid wait list will form in the Rose Wagner box office one hour before show time. You must be there, in person, to get on the wait list. Then check back five minutes before show time. As many waitlisters as possible will be seated at show time. Those who can’t be seated will receive a full refund. 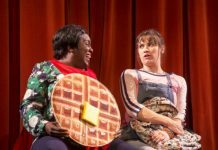 “The Weird Play” runs 70 minutes with no intermission.